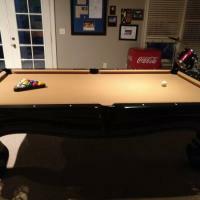 4" x 8" Westwood billiards table. 1 inch slate, Queen anne legs, mother of pearl inlays and black finish with tan felt. Home use only in great condition. Full set of balls, cover, and three sticks included.